ARLINGTON, VA – January 28, 2013 – In celebration of Black History Month and as part of its year-round commitment to diverse programming, PBS today announced an on-air lineup commemorating the contributions of African Americans in music, dance, television and civil rights, providing an in-depth look at key figures and events that shaped black — and American — history. In addition to these programs, PBS announced it will launch the PBS Black Culture Connection, a digital storybook of black films, history, trends and discussion that’s available throughout the year on PBS.org, on February 1, 2013. A video showcasing the PBS Black History Month programming schedule and PBS Black Culture Connection is available to view or embedhere. “The PBS Black Culture Connection is a digital resource that unites a diverse collection of films and other content across PBS. It's a screening room for award-winning documentaries and films, a forum to engage in meaningful discussions, and a library to explore hundreds of videos, articles, quizzes and resources like historical maps and timelines,” said Jason Seiken, PBS SVP and General Manager, Digital. LIFECASTERS, premiering Thursday, February 7, 2013, 9:00-10:00 p.m. ET (check local listings), unites fiction and documentary filmmakers to tell stories of Americans who use their strength, creativity and determination to reach their goals — a bit later in life. In one segment, Oscar-nominees Steven Bognar and Julia Reichert observe African-American dancer Sherri “Sparkle” Williams, one of the oldest female professional dancers still practicing in the U.S.
Whitney M. Young, Jr. was one of the most celebrated — and controversial — leaders of the civil rights era. In INDEPENDENT LENS “The Powerbroker: Whitney Young’s Fight for Civil Rights,” premiering Monday, February 18, 10:00-11:00 p.m. ET, follow his journey from segregated Kentucky to head of the National Urban League. Unique among black leaders, Young took the fight directly to the powerful white elite, gaining allies in business and government, including three presidents. He had the difficult tasks of calming the fears of white allies, relieving the doubts of fellow civil rights leaders and responding to attacks from the militant Black Power movement. 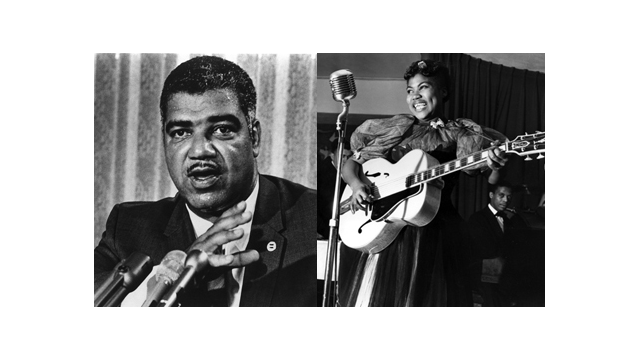 InAMERICAN MASTERS “Sister Rosetta Tharpe: The Godmother of Rock & Roll,” premiering Friday, February 22, 2013, 9:00-10:00 p.m. ET, discover the life, music and influence of African-American gospel singer and guitar virtuoso Sister Rosetta Tharpe (1915-1973). Southern-born, Chicago-raised and New York-made, “She could play the guitar like nobody else … nobody.” During the 1940s-60s, Sister Rosetta introduced the spiritual passion of her gospel music into the secular world of rock ’n’ roll, inspiring the male icons of the genre. One of the most influential musicians of the 20th century, Tharpe may not be a household name today, but the flamboyant superstar, with her spectacular playing on the newly electrified guitar, had a major influence on black musicians, including Chuck Berry, Little Richard, Isaac Hayes and Etta James, and also on white stars such as Elvis Presley, Johnny Cash, Jerry Lee Lewis and Carl Perkins. Gwen Ifill interviews Berry Gordy, founder in 1959 of Motown Records, which became the most successful African-American-owned enterprise in the United States, in AN EVENING WITH BERRY GORDY, airing in February 2013 (check local listings). Gordy’s celebrated life as entrepreneur, songwriter, record producer, movie director and producer has left an indelible influence on music and films nationally and internationally. Performing one tribute song from Gordy’s musical career, representing the old and new school Motown, are Valerie Simpson (Ashford & Simpson) and R&B musician KEM. Gordy’s son, Stefan Gordy — known to the music world as Redfoo — one-half of the hip-hop musical group, LMFAO, will be in attendance. Encore Programming THE ABOLITIONISTS: AMERICAN EXPERIENCE Sundays, January 13-27, 2013, 10:00-11:00 p.m. ET Witness the struggles of Frederick Douglass, William Lloyd Garrison, Angelina Grimké, Harriet Beecher Stowe and John Brown to end slavery. AMERICAN MASTERS “Cab Calloway: Sketches” February 2013 (check local listings) Explore the life of this pioneering jazz legend who charmed audiences with his bravado and showmanship. BLACK IN LATIN AMERICA February 2013 (check local listings) Travel with Harvard scholar Henry Louis Gates, Jr. as he uncovers Latin America’s African roots. FREEDOM RIDERS: AMERICAN EXPERIENCE February 2013 (check local listings) Find inspiration in the story of the young civil-rights activists who journeyed through the Deep South in 1961. INDEPENDENT LENS “The Black Power Mixtape 1967-1975” February 2013 (check local listings) Take a cinematic and musical journey into the black communities of America, 1967-1975. INDEPENDENT LENS “Daisy Bates: First Lady of Little Rock” February 2013 (check local listings) Learn why this unconventional revolutionary paid dearly for her instant fame. INDEPENDENT LENS “More Than a Month” February 2013 (check local listings) Find out why an African-American filmmaker wants to end Black History Month. UNDERGROUND RAILROAD: THE WILLIAM STILL STORY Friday, February 15, 2013, 10:30-11:30 p.m. ET Hear the story of William Still, a free black man who accepted delivery of “human cargo” on the Underground Railroad. SLAVERY BY ANOTHER NAME Friday, February 22, 2013, 10:00-11:30 p.m. ET Explore the story of labor practices and laws that effectively created a new form of slavery in the South. Laurence Fishburne narrates. Other series that routinely cover topics and profile guests and performers of particular interest to African Americans include FRONTLINE, GREAT PERFORMANCES, PBS NEWSHOUR, NEED TO KNOW, POV, TAVIS SMILEY and WASHINGTON WEEK WITH GWEN IFILL. Find more information and high-resolution images from these programs on PBS PressRoom.